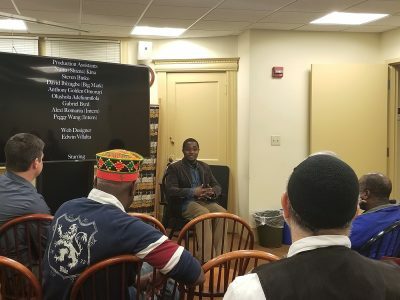 Rahman Oladigbolu sat facing the room of students in the African Studies Center Wednesday as he delved into the behind-the-scenes work of his film, “In America: The Story of the Soul Sisters.” Oladigbolu was the director, producer and screenwriter of the film. He said he invested a lot of time into accurately portraying the immigration experience and the struggles immigrants face. After he finished discussing his film with the audience, “Soul Sisters” played on a big television in the small room. “Soul Sisters” is set in America and entails the story of two women who meet upon a chance encounter and learn to lean on each other as they face various trials in life. The film screening of “Soul Sisters” was part of the CinemAfriq film series and was organized by the BU African Studies Center, the African American Studies Program and West African Research Association (WARA). Sade, a character in the film, is a Nigerian woman who immigrates to the United States illegally with hopes of bettering her future and then later experiences the struggles of the American dream. Sonya, the other main character, is a young African-American woman who is caught between her parents’ separation and the difficulties regarding cultural ambiguity. Kate Luongo, a professor of African History at Northeastern University, attended the event and said the film made her feel invested in the characters’ storylines. Caroline Johnson, operations manager of WARA at BU, said one of association’s objectives is to “engage with the diaspora,” and that this film addresses the same topic. “As you know, the main character is from Nigeria moving to the U.S., and so the film talks about the types of issues that are faced by members of the diaspora, whether they be more immediate immigrants or even African-Americans who consider themselves members of the diaspora,” Johnson said. Eric Schmidt, assistant director of the African Studies Center, said although this wasn’t addressed in the discussion beforehand, he noticed a recurring theme of food in the film. “There was a restaurant that they worked at called ‘Afro-Soul,’ and the informs of food was used as a means to bring people together and talk about their experiences,” Schmidt said. As the film ended, Oladigbolu resumed his position from the pre-screening discussion in front of the audience and answered questions about the film. In the Q&A, Oladigbolu said that there couldn’t have been a better time to make this film given the political climate and lack of empathy in some politicians. Oladigbolu emphasized the power these individuals’ experiences can have when more people see them. Oladigbolu said the film was based on a true story and said he drew inspiration from the African-American community in Roxbury that embraced him when he first came to America. While he lived in the community, he said he realized that Africans and African-Americans didn’t know what the other side was going through. “The immigration experience is different and takes a toil on people,” Oladigbolu said. During the Q&A, a member of the audience asked Oladigbolu how people in Nigeria engaged with the film because the film “made it seem like you don’t want people to come to America.” Oladigbolu said that was not his intention and that he just wanted to inform people’s expectations before they go. “I want people to look at this and not wait for their life to start,” he said in response. Several of the audience members commented on the ending of the film and asked why it turned out the way it did. Oladigbolu said that Sade was a medical student, but she had to leave her country after the schools she could have attended disappeared. “This is what the African leaders are pushing their citizens to go through,” Oladigbolu said.